Over the last few years, more and more anglers are prepared to travel to catch fish, and that's why we designed the Diplomat Spin Series. High quality 24 ton graphite construction, wooden reel seat, finished with an attractive cork handle and an SS304 guide system. 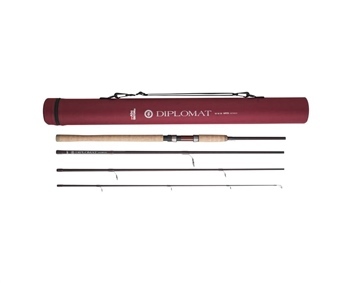 These are four-piece rods that are easy to travel with, and are supplied in a protective Cordura tube. The Diplomat series comes in 8, 9, 10 and 11'6'' lengths. Abu Garcia New Black Max Combo 6ft 6"
Abu Garcia New Pro Max Combo 6ft 6"